THE EXPLORATION OF MICROECONOMICS, 5e, International Edition, is not a traditional encyclopedic text filled with technical details. Rather, it is an engaging, modern, "back-to-basics" book designed to promote microeconomic literacy and to help students appreciate how microeconomics affects their everyday lives. This reader-friendly text includes innovative learning tools, a visually appealing design, and captivating content to encourage students to read the chapters eagerly and help them master the material more easily. In addition, a comprehensive study guide included with every copy helps students reinforce their learning and better prepare for course assignments and exams. 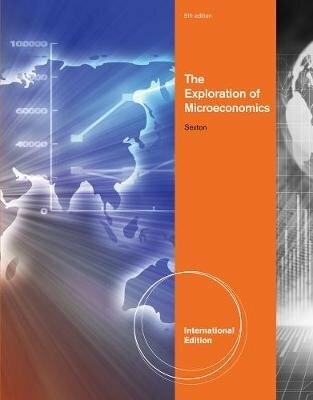 Packed with examples from current events and pop culture, THE EXPLORATION OF MICROECONOMICS, 5e, International Edition succeeds like no other text in making microeconomics less intimidating and in achieving the author's primary goal: conveying the real-world relevance of microeconomics and inspiring in students the same excitement he felt when taking his first microeconomics class.